Emilys Aufgabe fÃƒÆ’Ã‚Â¼r das Kartenspiel war diesmal ein Symbol, welches man liebt auf seiner Karte 4 zu verscrappen. Nun, sie selbst hat das Friedenssymbol genommen, welches ÃƒÆ’Ã‚Â¼brigens auch eines meiner Lieblingssymbole ist, so daÃƒÆ’Ã…Â¸ ich beschloÃƒÆ’Ã…Â¸ ein anderes zu nehmen :-) Und zwar :-) …also ein Smiley. 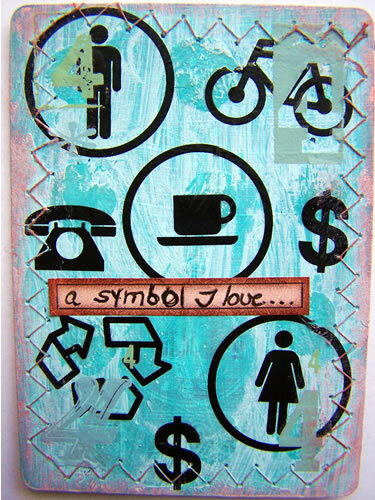 Emily’s challenge for the deck is this week “a symbol I love”. Well, she herself chose the peace symbol which is one of my favorite symbols, so I decided to take a different one :-) and this is :-)…a Happy Face. Einen :-) Tag! Have a :-) Day! so cool! 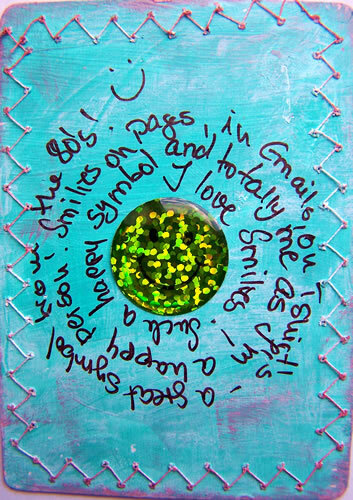 love the colors, your stitching and the symbol that you chose! this is so fun…so fun to see everyone’s version of each week’s prompt too! Yeah cool symbol!! You totally rocked that card! Eindeutig – der Smiley passt zu Dir wie Faust aufs Auge :) Sehr schÃƒÆ’Ã‚Â¶ne Karte!!! way cool … love your card!